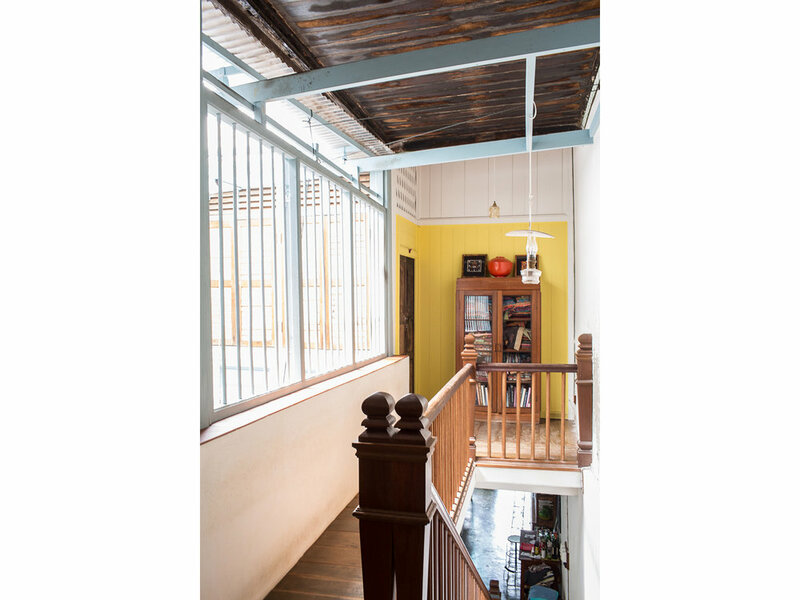 Lovingly renovated two-story shop house combining a contemporary, open feel and heritage elements. A quiet oasis in the midst of this colourful city's hustle and bustle. Indoor-outdoor living downstairs, air-con upstairs. Three bedrooms, two full baths, a cook's kitchen, ample storage space and rare private courtyard exiting onto quiet back lane -- all walking distance to fabulous street food (Asia's best! ), bars/restaurants, two fresh markets, galleries and boutiques, shopping mall and gym and George Town's year-round street festivals. An ideal primary or secondary residence, vacation rental property or event/pop-up/cooking school space with rooms to let above. Sold mostly furnished, with high quality pieces. Price on Enquiry. No GST (General Sales Tax). Timber and glass partition separating entryway from living area. Living area with air well/dining area and kitchen beyond, courtyard at rear. Mid-century northern Thai teak cabinet included in sale. Dining area, retractable roof over air well above. Looking to front of house with timber/glass partition and entryway beyond. Stainless steel bench, marble and timber-topped freestanding workbench, 5-burner cooker with wok ring, induction hood with booster fan, dishwasher and washer/dryer. View from staircase, vintage blue-glass metal-framed windows looking on to courtyard. 5-burner cooker with induction hood, tiled backsplash, stainless steel counters to either side. Double refrigerators to left. In kitchen: teak bar, tall shelving units salvaged from coffee shop in Thailand. View of courtyard from door to kitchen. Tile-roofed bath 'house' in corner (toilet, sink, shower). View from master bedroom, small bath 'house' (sink, toilet, shower) with louvered glass window in upper left corner, red door at rear leads to quiet back alley with space to park car. Entrance to bath in courtyard. Top of stairs. Blue doors lead to office/bedroom at front of house. To right of stairs, TV room/bedroom with sliding timber doors. Open windows to right overlook air well with retractable roof above. At top of stairs, sliding timber doors open to a small TV room, bedroom or office. Doors slide to completely enclose room. Windows opposite couch overlook interior air well with retractable roof. 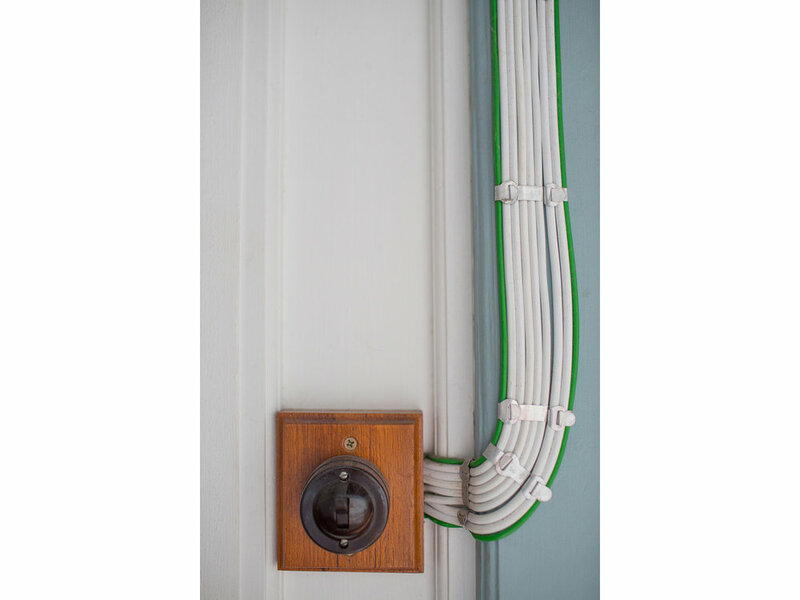 Detail: old-fashioned exposed wiring, bakelite switches, throughout the house. Entrance to master bedroom at end of upper floor hall, to left of cabinet. Open windows looking on to air well, retractable roof above. Stained timber ceiling above is original to the house. View from entrance to master bedroom. Windows overlook rear ground floor courtyard, bathroom to the right. Rebuilt mezzanine above king bed. Wide-plank timber floors as throughout upper floor. View of master bedroom from rear. Windows look on to interior air well, with double-door entry to left of windows. Timber ceiling. Walk-in closet to left (2 rods, shelving on either side), huge storage space above closet via double timber doors. Entry through original timber door, louvered glass windows on two sides, terra cotta tiles, open shower beyond toilet. Toilet, open shower, built-in marble shelving. Sink is on wall opposite toilet. 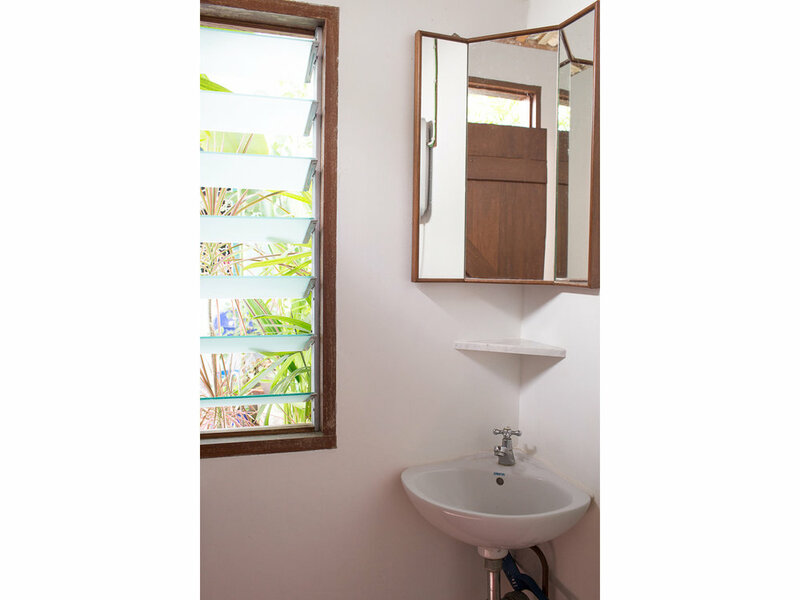 Sink and mirror, built-in shelving, original timber door. Wall fan. Toilet is on wall opposite sink.